Do you ever feel like you’re in clean up mode a lot? Without good systems, the time it takes to do routine tasks often takes longer. If it weren’t for one of my systems, this software review would still be sitting in my revision folder. You see, I favorably reviewed Piriform’s CCleaner in June of 2006. Back then, it was just for Windows. 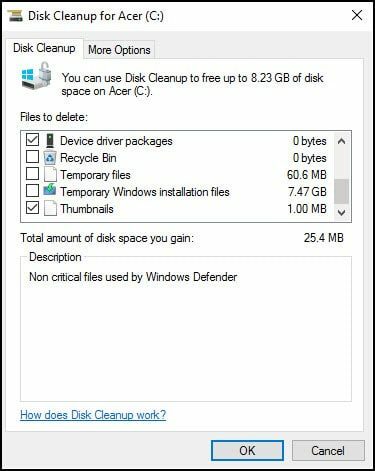 Lots have changed with this disk cleanup and optimization tool. The reason I placed the original review in my revisions folder was I knew the software had changed. I find outdated software reviews don’t have much value, especially with old screen shots. However, my appreciation for the software remains strong. This is a free utility produced by Piriform, a software firm based in London, UK. They describe the program as a system optimization tool. 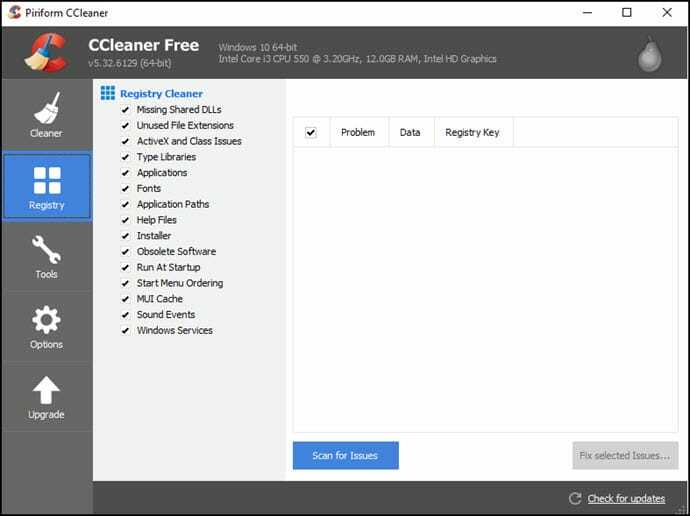 Some of the more descriptive fans refer to it as a “crap cleaner” because it removes many unwanted files and programs that PC vendors used to install on your systems. It’s not just limited to removing bloatware. However, it is not a malware or virus scanner. Typically, operating systems and browsers come with their own set of cleanup tools. 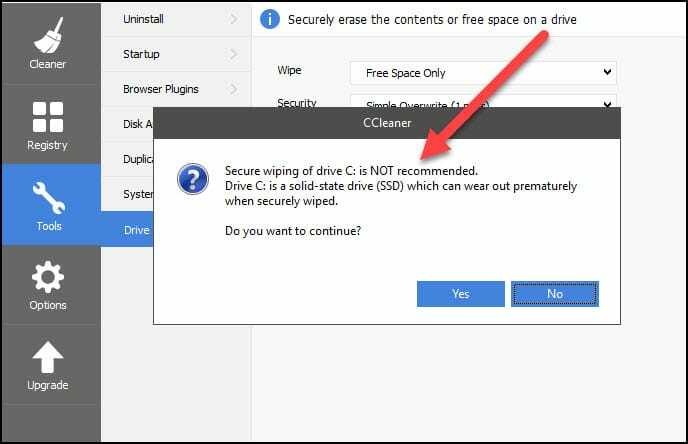 For example, Windows comes bundled with its own disk cleanup tool as does Google Chrome. There is overlap between the tools, but I think the differences come down to ease of use and control. CCleaner consolidates many of these tools. While it’s nice to have multiple platforms, I like that the software hasn’t gotten away from its roots and added unnecessary features and complexity. The program still includes a pleasant interface that lays out tasks in a nice manner that works well for both beginners and advanced users. Along the far-left column, you have a series of large icons representing the three major areas: Cleaner, Registry and Tools. Below that you have Options and Upgrade. The items to the right are items specific to that area. In the screen snap above, I’m using the Cleaner section. To the right, I have two tabs indicating areas of my PC to clean. The first tab is for Windows , my operating system, and the second is for Applications  I have on the PC. 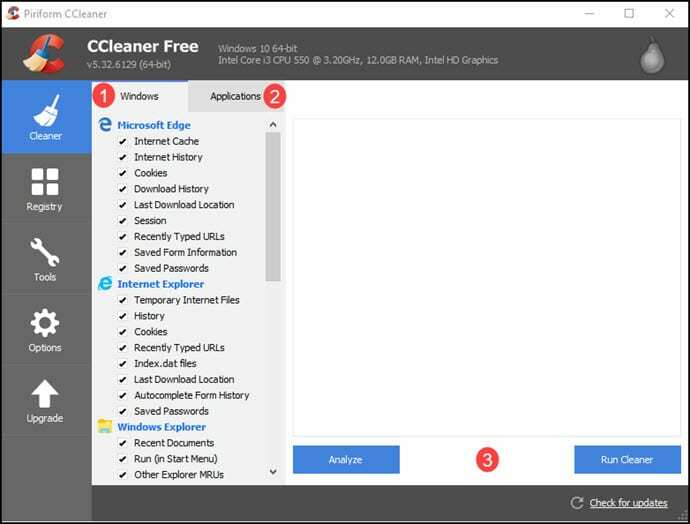 I can simply check which items CCleaner should explore. From there, I can select to Analyze or Run Cleaner . 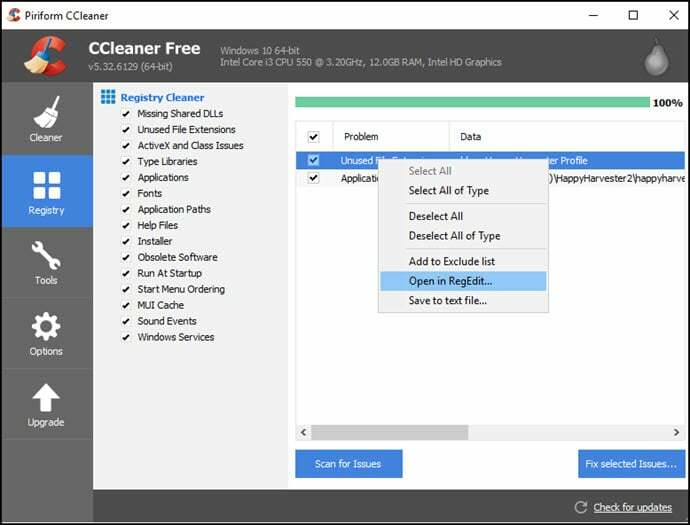 The two actions of Analyze and Run Cleaner also show some of the safety features of the program. As with any system utility, it is easy to do something you didn’t intend. Throughout the program, you’ll see examples where you’re given options such as analyzing files first or backing up your registry. In contrast, my Windows program tends to group files in more generic categories. However, this utility is produced by the same folks who make the operating system, so I have a high degree of trust. One of the main reasons I was drawn to CCleaner in 2006 was because of privacy. Back then, it was difficult to remove certain files such as index.dat, which was used by Internet Explorer. Today, more people are questioning what gets left behind by their browser. These remnants vary based on which web browser or application you use, but often include cookies, temp files, typed web addresses, history and so on. As you can guess, there is a trade off between convenience and privacy. The Cleaner tool is most likely the area you’ll use the most. Its main function is to clear your browser, operating system and programs from accrued cruft. You can think of “cruft” like electronic “dust bunnies“. One reason I like this tool is I can select what to remove and see the results before the deletion using Analyze. This feature makes it a nice learning tool if you want to check an option and see the results. For example, if I select Microsoft Edge and Cookies, I can see which cookies will be deleted by right-clicking. I’ve seen too many registry cleaners and system optimizers which make it too easy for the user to get into trouble. This tool scans your system registry files for a series of problems. It’s not as robust as some registry cleaners I’ve seen, but it is fast. It also allows you to backup entries you delete. I’m comfortable with this section as I’ve been using it for a long time. I’m also familiar with the Windows Registry. However, if you’re not familiar with these terms, backup and go slow. The thing about registry tools is they tend to find problems that really aren’t problems. I’ve seen people get overzealous and attack these errors like some people try for “inbox zero”. Another reason I suggest caution is one of the few issues I have with the software – documentation. Although the program does a good job of providing alerts and notices, one area that could improve is the online help. It seems this area was kept to a minimum to reduce the size of the installer. I think there are ways to provide more help into the program and still keep the size small. As example, the program could include tooltips or pop-ups so when the user hovers over an item such as Type Libraries, they would have a better idea of the item. One thing the tool does is provide more options if you right-click an entry. This can be very useful if you need to find open an item in RegEdit or filter by a certain type. This is another area where the company has put in some safeguards. For example, it recognizes that one of my drives is a solid-state drive (SSD) and suggests I not use the feature. The cleaning process is straightforward. Initially, the program checks entries it figures you want to be cleaned. Typically, when I test these types of programs, I start slow and then build up so I can see how the program works. OK, so I’ve now has 10 years with this program. One aspect that may throw first-time users is that the program will clean files based on your selections on the Windows tab and the Applications tab. The Applications tab shows many of your other programs such as browsers, Microsoft Office programs and so on. There is not a separate cleaning process for the Applications tab. Once you make your selection, you can hit the Analyze button to see which items will be deleted. If any of the programs you selected are opened, the program will tell you to close them first. The program also shows you the estimated file size and the deletion method based on your options. To finish the cleanup process, you click the Run Cleaner button. Again, CCleaner informs you the files will be permanently deleted when you click OK. The program will start to delete the files and a progress bar displays at the top. The program eventually displays a listing of the deleted files and states the cleaning is complete. You can also save a listing of the deleted files by right-clicking in the right pane and selecting Save to text file? 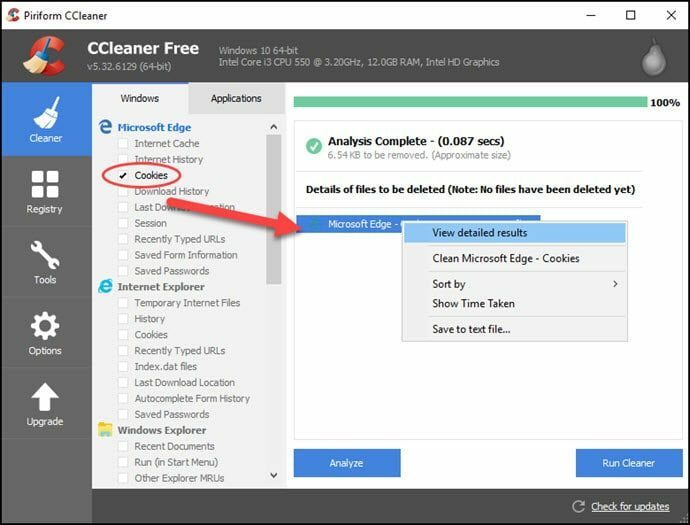 Read the Introducing CCleaner guide the company posted on their website. It gives more information on the program. The company also has a forum area where people can post questions. Find out which cookies you want to save before doing your first cleaning. Always use the Analyze button before Run Cleaner. It doesn’t take that long to glance at the analysis to see what will be deleted. Don’t go hog wild and delete everything on your first try. I would start with one category and see what the analysis shows. Pay attention to the alert messages. I would be inclined to backup any registry entries if prompted. Don’t feel compelled to delete everything just because an option exists. If you’re not comfortable with an option or don’t think it would help, don’t use it. On September 18th, the company issued a security advisory fro version 5.33.6162. This was a surprising breach as PiriForm parent company is AVAST, a well-known anti-virus firm. The incident illustrates that no company is safe from hackers. It is also a good example of why you should have automatic updates turned on. You can read the company’s response here. If you're looking for free tools that can help clean your system or remove tracking information, this one is well worth your time. It's fast, clean and allows you the ability to decide what to remove. It may not have as many options as commercial programs, but it certainly alleviates your privacy concerns and clears the unwanted files from your computer.